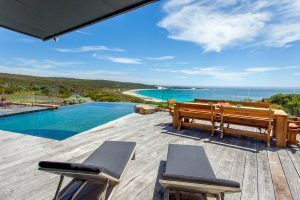 An iconic, one-of-a-kind Margaret River home, set into the hillside overlooking breathtaking Injidup Bay, could now be the base for your next luxury escape. Injidup Bay House is situated on a stunning and private 5.5acre property surrounded by unspoilt native bushland with sweeping views across beach, bush and ocean. Sleeping 12 people, the unique home is packed with warmth and character, featuring local stone and timber, and complementary décor and furnishings. The home has just been listed by luxury West Australian holiday home booking service provider, Private Properties, and Director David Moyes said this was a remarkable holiday home in a spectacular location. “Injidup Bay House combines an incredible location with a contemporary rustic style that gives it great character and warmth. “It is expansive – with six bedrooms, five bathrooms, open plan kitchen and living, office, outdoor entertaining area with lap pool, and even a secret poker room – but feels so inviting and familiar. “Lasting holiday memories will be made at Injidup Bay House and we’re thrilled to include it in our offering of luxury Margaret River Region holiday homes,” David said. There are only 10 house sites approved in the whole of Injidup Bay and only five, including Injidup Bay House, have been built on so serenity and sweeping nature views are guaranteed. Injidup Beach is one of Margaret River Region’s most spectacular beaches. Its crystal-clear waters are perfect for swimming, surfing, beachcombing or just getting back to nature. It is a short distance from scenic Caves Road and its array of beautiful wineries, restaurants, breweries and gourmet producers. Private Properties manages some of Western Australia’s most exclusive holiday homes with a portfolio of more than 100 properties from the Swan Valley to Margaret River and Albany.